37/159 David Mumpower Paint by numbers formula and a heapin' helpin' of revisionist history does not stand in the way of fully functional feel good jocktainment. Don Haskins was a two-time All-State basketball player in Oklahoma. He was recruited by a future Hall of Fame coach named Hank Iba to be a scholarship athlete at Oklahoma A&M. During his tenure, he was selected the team captain and was chosen for the All-Conference team as a senior. He was also named the MVP of the All-College Tournament. And none of these monumental successes were what made him a legend (albeit a controversial one) in his own time. After his playing days were finished, the natural evolution for a born leader such as Don Haskins was to move into the coaching realm. He got his start at the high school level where he excelled with 157 wins in 198 games. That's an almost incomprehensible winning percentage of 0.793. When a high school coach wins approximately four out of every five games his team plays, athletic directors on the next level notice. Don Haskins was approached about taking the reins of the University of Texas at El Paso. Little did the young man realize at the time that it would be the last job he would ever take. Some 38 years later, he retired from the program. His final record as a college coach was 719-353, and that win total was good for fourth place all-time. In 38 years, he led his team to 11 regular and postseason conference championships along with 21 NCAA/NIT berths. In only four seasons did Haskins coach a team with a losing record, and his future place in the college coaching Hall of Fame is assured. But even these accomplishments are not what make Haskins a hero worthy of a Disney film. Instead, it was his historic role as a still young and inexperienced coach in 1966 that became the stuff of myth and legend. His team that year just so happened to be all-black. In the trying times of civil unrest during the 1960s, this was one of the most significant events in the world of athletics. Don Haskins took this talented group of African-American players, and he molded them into a precursor for the modern game. Rather than play conventional, slow paced, set shot basketball, Haskins unleashed his group of studs on an unsuspecting collegiate world. The result was the only NCAA title of his career. Even better, it came against an equally legendary coach named Adolph Rupp, a man who had fought against the eligibility of black athletes in NCAA basketball. 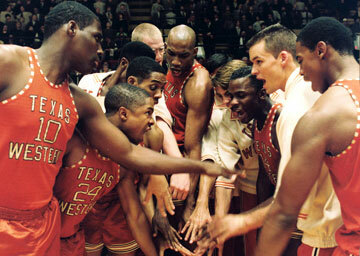 See the latest developments for this project on the Glory Road Movie News page.